"This recipe can be used with chicken, beef, pork and even venison. It freezes well, and can be made into burritos, tacos, or any number of other Mexican-style dishes. This dish uses a lot of spice, so please be sure to adjust to your taste." Trim the roast of any excess fat, and season with salt and pepper. Heat olive oil in a large skillet over medium-high heat. Place the beef in the hot skillet, and brown it quickly on all sides. Transfer the roast to a slow cooker and top it with the chopped onion. Season with chile peppers, chili powder, cayenne pepper, hot pepper sauce, and garlic powder. Add enough water to cover 1/3 of the roast. Cover, and cook on High for 6 hours, checking to make sure there is always at least a small amount of liquid in the bottom of the cooker. Reduce heat to Low, and continue cooking for 2 to 4 hours, or until meat is totally tender and falls apart. Transfer the roast to a bowl and shred it using two forks (reserve 2 cups of cooking liquid, if desired). Serve in tacos or burritos (see Cook's Note). 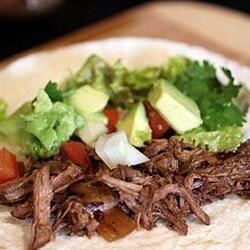 If using the meat for burritos: shred the meat and add it to a frying pan with 1 cup of the cooking liquid. Simmer until the sauce has thickened, about 15 minutes. To freeze the meat, transfer it to a freezer-proof container and add reserved 2 cups of cooking liquid. Freeze up to 6 months; thaw in refrigerator or microwave. This recipe also works for pork and chicken. If you're using chicken, remove the skin before cooking and reduce the cooking time to 4 hours on High or 8 hours on Low. Remove the bones and shred the meat after cooking. My husband is addicted to this meat. I make it almost weekly and we use it in everything ... nachos, burritoes, salad, soup, etc. It freezes very well for a quick meal.